Color(s): May be solid or mixed. White, gray, tan, or golden. 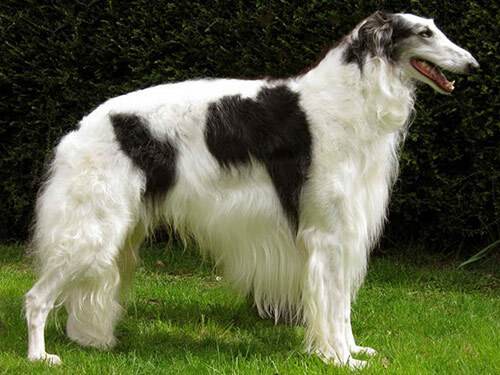 Also referred to as the Borzoi, this breed was bred by Russian aristocracy during the 17th century. This elegant sight hound excelled in, and were prized for, their bravery and fierceness in wolf hunting. The first Borzoi was introduced into the United States in 1889. Today this breed is highly regarded for their gentle nature, beauty, intelligence, and companionship. However, the Russian Wolfhound is still used by farmers in the Western states to control the Coyote population. The Russian Wolfhound breed is statuesque and possesses an aristocratic demeanor. They have a long, thin narrow head and a slightly arched muzzle. The Russian Wolfhound is considered to be the most elegant and graceful of all breeds. Russian Wolfhound's are a breed of beauty, speed, courage, and power. The Russian Wolfhound is not recommended for homes with young or small children. A home with older considerate children is best. They do well with other dogs provided the other dogs are not considered a Toy breed. As a sight hound, this breed will chase and potentially kill any small fleeing animals, so cats and other small pets are discouraged. They are loving and highly loyal to their family. Russian Wolfhound's are quiet, independent, gracious, and sensitive. The Russian Wolfhound is extremely well-mannered and is not used as guarddogs or watchdogs. Russian Wolfhound's require regular brushing of the coat with a firm bristle brush. Bathing should only be done when necessary. It is important to keep the paw pads trimmed to prevent splaying. This breed is sensitive to medication. They are prone to bloat and should be fed two to three small meals per day. All exercise should be avoided after meals. The coat of the Russian Wolfhound is long in length, and may be flat, wavy, or curly. It is short and smooth on the front of the legs, ears, and head. The coat around the neck is more profuse and curly. There is long and profuse feathering on the tail and hindquarters. Russian Wolfhound's are seasonal heavy shedders. Early socialization is recommended. However, as free-thinking sight hounds, the Russian Wolfhound does not do well in obedience training. They are extremely intelligent and capable of learning, but training should only be done with respect, fairness, and consistency. The Russian Wolfhound will do okay in an apartment if sufficiently exercised. However, they do best in a home with a securely fenced yard. They make excellent walking and jogging companions provided they are very securely leashed. This breed displays talent in lure coursing, hunting, and sighting.